When this old-fashioned epic honoring the brave men and women who dedicate their lives to saving others as firefighters was first released in 2004, on the surface it looked like it was a salute to the everyday heroes who stepped up to help search and rescue on September 11, 2001. However, further research revealed that it was written prior to 9/11 and originally set in New York but understandably changed its location after that fateful day to Baltimore, Maryland in this saga that follows Jack Morrison (Joaquin Phoenix) from his earliest days as a probationary trainee to a full fledged veteran with years of service with his fire station group, Ladder 49 that’s led by Captain Mike Kennedy (John Travolta). Bookending the film with a horrifying blaze that finds Jack trapped in a huge building while Kennedy and the others on his crew try to rescue him, Jack looks back on the events that had led him to that particular moment in time including not only his role as a fireman but also a husband and father. Although some critics felt the work was overly sentimental and pointed out the film’s admittedly episodic structure, I felt that it was respectful and highly compelling filmmaking with the only major flaw being the unconvincing makeup of Phoenix and Jacinda Barrett who played his wife as-- throughout the picture-- they looked exactly how they did when they first met even though supposedly ten years had gone by. 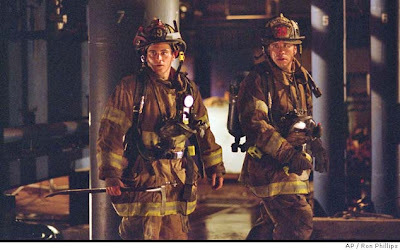 Impressively, IMDb reported that every fire related incident in the film depicted an actual event that occurred within the United States and while, at times one can predict the events that may possibly happen to further the narrative, it’s elevated by the script by Lewis Colick (who worked on the screenplays of the equally old-fashioned October Sky and Beyond the Sea) along with the thoughtful direction of Jay Russell (My Dog Skip, Tuck Everlasting). Of course, it’s the thinking person’s action star Joaquin Phoenix who completed extensive academy and job training that’s the real star of this picture, managing to capture several emotions in a single scene and in the end will undoubtedly make even the toughest viewer find it nearly impossible to fight back tears.